It is NOT necessary to connect your markers in a loop but sims will still run through every marker in a room and then back to the one they started from before looping through same course again. In fact if you just want sims running round and round the same spot the entire time placing just one marker should do. The arrows on the marker indicate the direction of the track so make sure they point correctly. Sims will try to run in a straight line from one marker to the next, so in order for them to run a curved path would probably require a few extra markers depending on how smooth you want the curve. 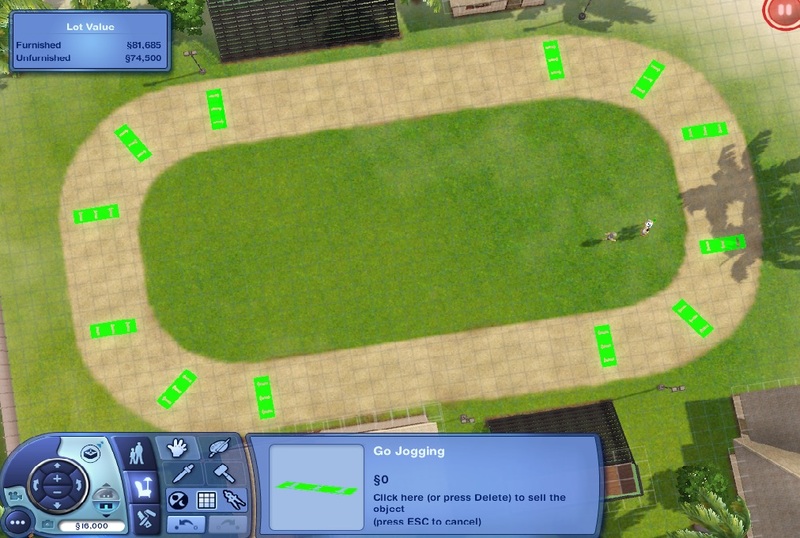 If there is an obstacle along the way though sims should be able to dodge them as they jog, so you could set up a 'bendy' track with just two markers placed in a straight line if you placed objects suitably in between them. You can't manually set the order of the markers are run in. The game will decide on the most "natural" path to take between marker to marker. (It should be safe to assume the marker that comes next is always chosen by distance and the general direction the current marker is pointing) You'll just have to experiment yourself to see how a more creative setup than a plain old circle or straight line will work. 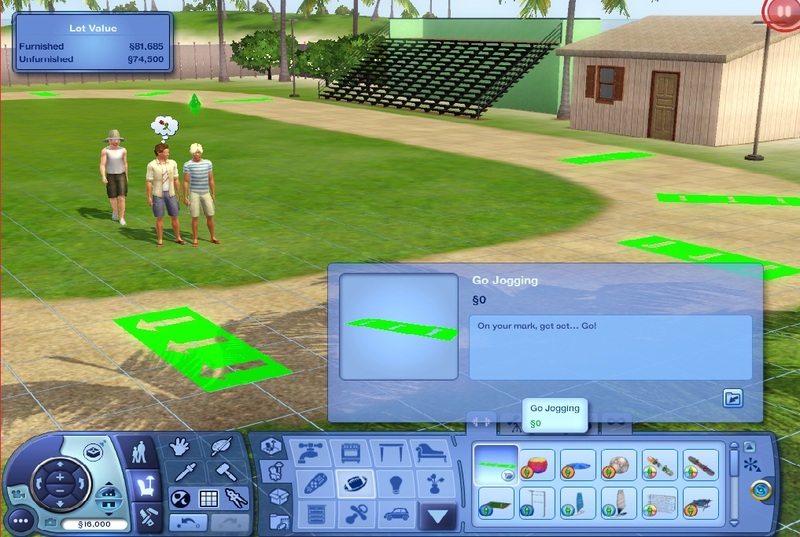 Sims will only consider markers in the same room as the one they start from, so you can have separate tracks on the same lot so long as they are in different rooms or separately fenced off areas. 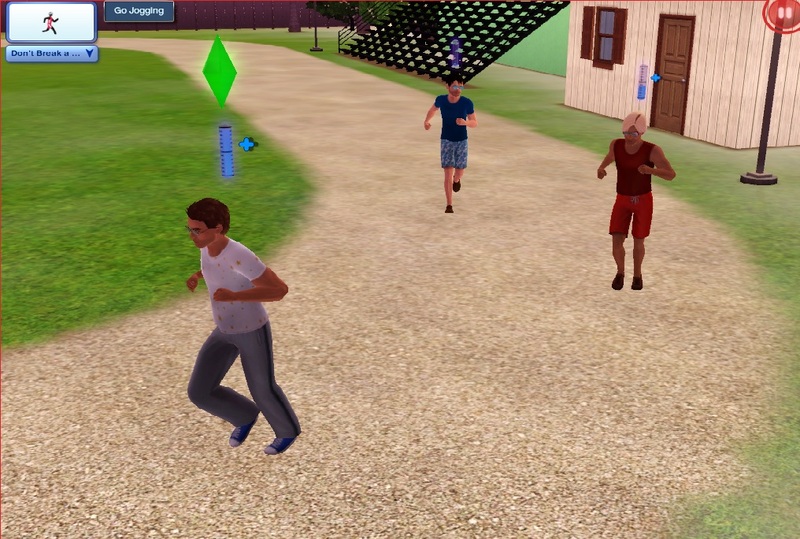 Up to 3 sims should be able to jog on a track comfortably at a time, any more and they will tend to bump into one another as they run but will still continue jogging anyhow. The markers are only visible in Buy and Build Mode so you won't be able to see them or click on them in Live Mode. 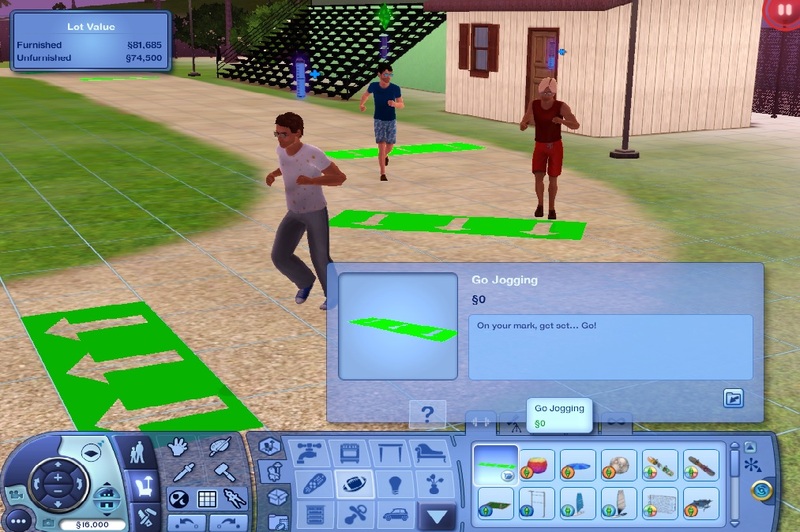 To get a sim to manually jog on a track just click anywhere on the floor of the room the track is on and use the Go Jogging interaction (requires at least 1 level of Athletic Skill or it won't appear). Unless the interaction is manually cancelled, sims will jog around the track until they become fatigued or have a dire need that needs tending to. Occasionally they will stop to recalculate routing, sometimes leaving the track to do so, but will immediately continue jogging afterwards. Since this is a newly scripted object it should not conflict with any other mods. There is an ITUN in the package for the autonomous version of the jogging interaction, the user directed version uses the tuning from the game's JogHere_Terrain ITUN so if you have another mod modifying it this mod will simply read and use the changes from there without conflicting. 1143 people have said thanks to icarus_allsorts for this download.